Yesterday, new artwork from Avengers: Age of Ultron was revealed, which were also accompanied by new character details for Vision (Paul Bettany) and Ultron (James Spader). 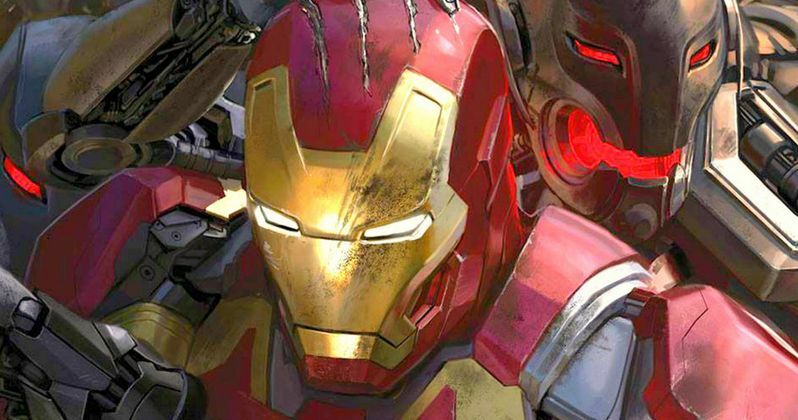 Today, Twitter user Prophets of Geek has discovered even more artwork, which gives us a fresh look at Scarlett Johansson's Black Widow and the Hulkbuster armor, which has Iron Man sitting inside of it. The new Hulkbuster artwork shows us the scale of this massive armor, when compared to Tony Stark's regular Iron Man suit, while Black Widow is getting ready for battle by brandishing what appear to be electric-charged batons. These images appear to be from licensed apparel related to the Phase Two sequel, but it isn't exactly clear where they are from. One of these images is particularly interesting, showing a hybrid of both Ultron and Vision, with half of each character's face fused together. Vision's biography released yesterday reveals that this character was created by the "combined genius" of Tony Stark (Robert Downey Jr.) and Bruce Banner (Mark Ruffalo), who has the ability to fly and project powerful beams of energy. Ultron, on the other hand, was first discovered as a computer program hidden within Chitauri ruins, which came to life after Tony Stark's experimentation. The Avengers are faced with their biggest challenge yet after Ultron upgrades its mechanical body to an "unstoppable form," as he carries on his mission to wipe out humanity. With just five months and one day remaining until Avengers: Age of Ultron hits theaters on May 1, hopefully we'll learn much more about Vision and Ultron in the very near future. Check out the artwork below from Marvel's Phase Two sequel, directed by Joss Whedon, and stay tuned for more artwork, photos and footage from what will surely be one of 2015's most anticipated movies.